Grant Erickson figured it was a dislocated shoulder at the most. 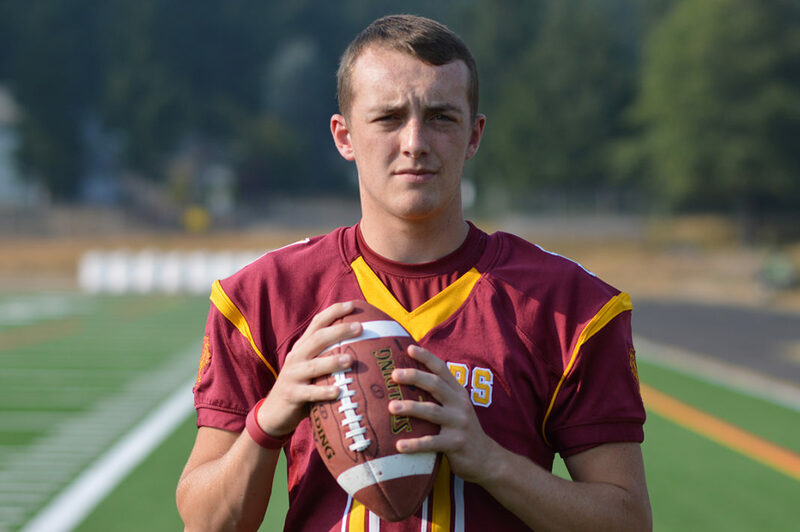 He knows now that wasn’t the most accurate assessment of the injury, but in his defense, the self-diagnosis came while under the weight of half of Timberline’s defensive line. A play earlier, the strong-armed quarterback had quickly rushed his Capital Cougars to the line in their hurry-up offense. The scoreless first half was winding down in the Cougars’ South Sound Conference opener last year against the Blazers, and Erickson was trying to put some points on the board before the intermission hit. Erickson knew he had more than enough weapons to score fast. What his team didn’t have, however, was the right formation. “It was the wrong (pass) protection and a couple guys went through,” Erickson recalled about the play which ended his sophomore campaign prematurely. Shortly after the snap, Erickson knew he had to eat the play and immediately tucked the ball away and braced for impact. His right shoulder absorbed the brunt of the collision as it was driven into the turf. Undeterred by the injury, Erickson got back under center and ran the final play. He credits adrenaline for that and for getting him into the locker room because the pain had subsided considerably. 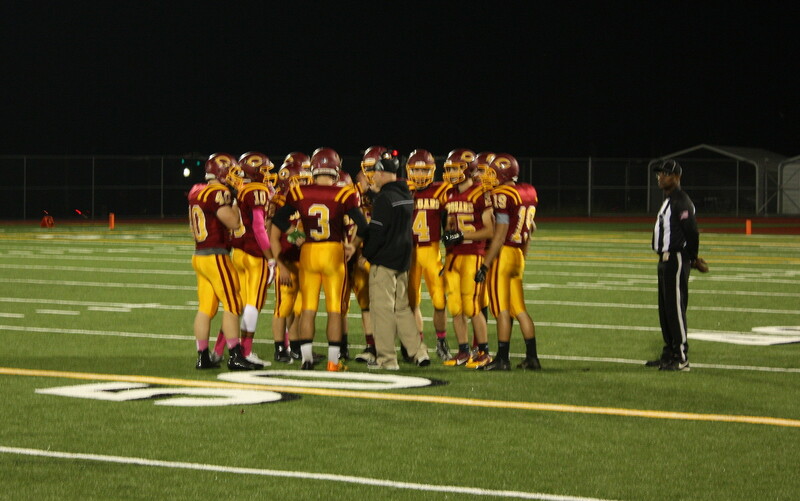 The Cougars ended their 2016 season third in the SSC. Unfortunately for the Cougars, they were going to have to game plan much longer than two quarters last season. Erickson had a broken collarbone. The doctors said he would be out at least eight to 10 weeks, ending the small chance he had of returning to the field in 2016. Capital would lose the game to Timberline, 12-7. The Blazers went on to capture the SSC championship. The Cougars finished third in the newly-formed conference, with their only other league loss coming by a slim margin to runner-up Peninsula (15-12), before seeing their season end to Ferndale in a district playoff game. Two surgeries – one to place a screw in his shoulder and one to remove it – and a one long off-season later, Erickson is back to 100 percent and looking to make up for lost time. It will be a different look Erickson in 2017 as the junior added 20 pounds to his 6-foot-6 frame since the end of basketball season, putting him at 215. 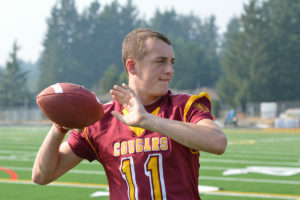 In addition to the added muscle, Erickson also sharped up his technique and mental approach to the game this summer through the RISE Football Academy, spending several weeks developing his fundamentals under Johnny DuRocher, a former Gatorade State Player of the Year who played QB at both the University of Washington and the University of Oregon. 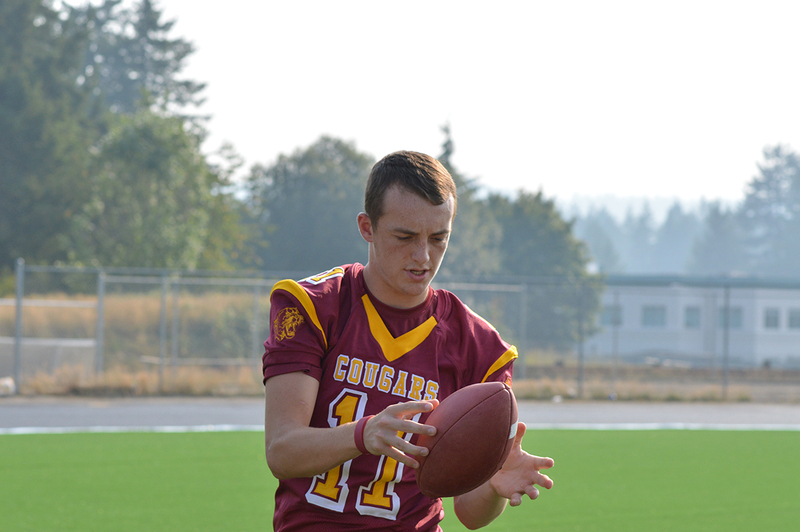 Erickson’s leadership will be called on even more following a tough summer for the Cougars. Head coach John Johnson resigned in July after 10 years with the program following allegations of lack of supervision of players at a football camp the previous year. 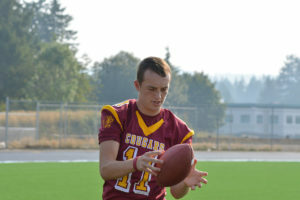 Erickson returns to the field this season leading the CHS Cougars as their #1 QB. Photo credit: Shanna Paxton. 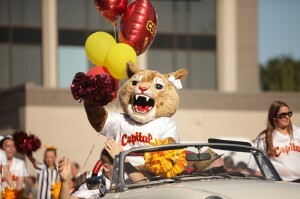 Darren Tinnerstet, a former Capital quarterback himself and long-time Cougars assistant, was named interim coach at the start of August. Injuries and coaching changes have only made the squad tighter, according to Erickson, providing them laser focus on their main goal of winning a conference championship. 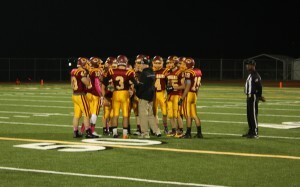 The Cougars will open their season at home on Friday, September 1 in a non-league game against River Ridge.